Teach cello with the popular Suzuki Cello School. The Suzuki Method® of Talent Education is based on Shinichi Suzuki's view that every child is born with ability, and that people are the product of their environment. 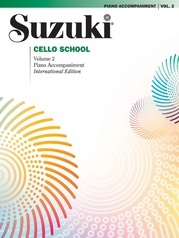 According to Shinichi Suzuki, a world-renowned violinist and teacher, the greatest joy an adult can know comes from developing a child's potential so he/she can express all that is harmonious and best in human beings. Students are taught using the "mother-tongue" approach. Each series of books for a particular instrument in the Suzuki Method is considered a Suzuki music school, such as the Suzuki Cello School. Suzuki lessons are generally given in a private studio setting with additional group lessons. The student listens to the recordings and works with their Suzuki cello teacher to develop their potential as a musician and as a person. This Suzuki piano accompaniment book for Volume 4 is integral for Suzuki cello lessons. Titles: Sonata in E Minor, Op. 14, No. 5 (Largo, Allegro, Largo, Allegro) (Vivaldi) * Danse Rustique, Op. 20, No. 5 (Squire) * Arioso from Cantata 156 (Bach) * Rondo from Concerto No. 4, Op. 65 (Goltermann).